Book #12 of the CLOAK GAMES series! I was done with Lord Morvilind. But the war with the Archon Elves was finished with neither of us. Morvilind has one last job for me. One final heist to decide the fate of humans and Elves both. 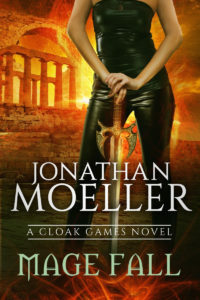 CLOAK GAMES: MAGE FALL, the twelfth and final volume of the CLOAK GAMES series, is now available on Amazon US, Amazon UK, Amazon DE, Amazon CA, Amazon AU, Barnes & Noble, iTunes, Kobo, Google Play, and Smashwords.